Somewhere on YouTube there’s a 2012 video of comedians James Adomian, Eddie Pepitone, and Todd Glass performing a spontaneous set outside of downtown’s New Jalisco Bar. The whole thing was caught on tape during the inaugural Riot LA Alternative Comedy Festival, a four-day smorgasbord of stand-up, panels, and screenings. It’s the type of intimate moment die-hard fans dream of: a chance to be fully ensconced in L.A.’s comedy scene rather than watch it unfold from the back of a theater. It’s also the type of moment Riot LA has built a rep on, one that’s catapulted the event from a scrappy Kickstarter-funded function to a fully sponsored phenomenon in only five years. 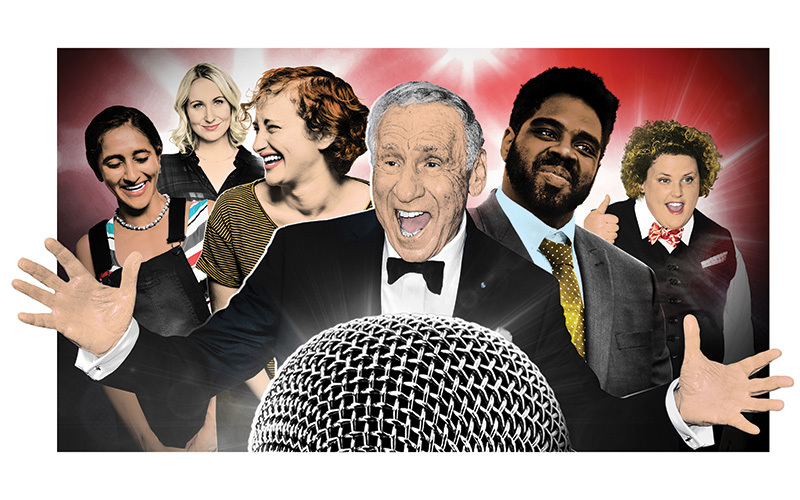 This year’s roster (January 19 to 22) is as impressive as ever, with Ali Wong, Felipe Esparza, Nikki Glaser, and 90-year-old Mel Brooks on the bill. Riot LA is the work of producer Abbey Londer, who wanted a fest that would, she says, “create a sense of community and celebration around the amazing comedy scene we have here.” In its earlier iterations, comedians performed in indie venues like the Smell; this year headliners are selling out theaters like the Ace Hotel and the Orpheum. Even so, Londer is determined to maintain the homespun vibe apparent in that old video. Fans and comedians can drink beers in a communal space known as “the Lot,” and cozier performances—such as Todd Barry’s crowd-work show—will be staged in smaller, unorthodox locations (think the cigar lounge at the Orpheum). Jo Firestone and Aparna Nancherla’s Web series, Womanhood, offers advice on everything from the perils of puberty to gracefully entering your “dirty thirties.” You’ll probably learn some helpful tips at their Orpheum show. That smile, those ruffles! Don’t miss Mel Brooks at #RiotLA! Head to Microsoft Theater for a screening of the 1974 classic. Comedy icon Mel Brooks, who cowrote, directed, and stars in the film, is on hand afterward for a Q&A. You don’t need no stinking badge, but you do need to buy a ticket in advance. Four authors have less than seven minutes to read their most thrilling excerpt in front of a panel of judges, who provide witty commentary. Featuring Mary Lynn Rajskub, Whitney Cummings, Sam Richardson, Marco Ramirez, and Zach Anner.